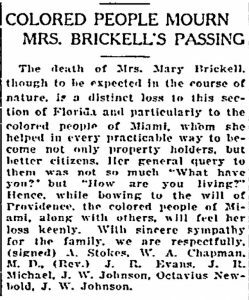 On January 13, 1922, Mary Brickell passed away. As the matriarch of the Brickell family, Mary led a great life and left an even greater legacy. Mary’s vision of a fine residential neighborhood has given way to high rises and urban sprawl. However, Miami residents of the first half of the twentieth century still remember and appreciate the beauty of the old neighborhood. While it still carries the Brickell name, it is not a place that Mary would recognize today. Mary Bulmer was born in Yorkshire, England on February 20, 1836. She met her husband, William Brickell, in Australia. 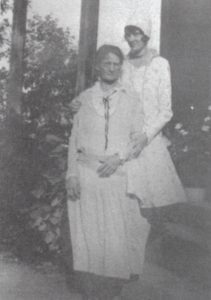 The Brickells had eight children: five girls and three boys. In 1871, the family moved to the area that would later incorporate as the City of Miami. The land they lived was referred to as Brickell Point. From the time of their arrival, the Brickells purchased and accumulated land south of the Miami River and Fort Lauderdale. They opened a trading post located at the mouth of the Miami River. However, it was their real estate holdings that made the family wealthy. At the turn of the century, Mary took control of the family real estate empire. She assumed the role of the family’s business head and was very shrewd during negotiations. However, it was said that she never foreclosed on a mortgage. Mary was both tough and compassionate in her business dealings. The Brickell’s were land rich but also had cash on hand to lend to those in need. Mary provided loans to people who didn’t drink and were of high character. During a time of segregation and bigotry in Miami, she would lend money to black people and Seminoles. She was revered in both communities for her generosity, trust and kindness. The day following her death, an article was written in the Miami Herald by leaders of the black community to express their feeling of loss. The article conveyed their condolences to the family. In addition, they thanked Mary for her help in allowing the community to become property owners and better citizens. She would make it a point to ask “How are you living?” to folks in disadvantaged communities. Mary Brickell was genuinely concerned about the welfare of all Miami residents. Her passing in 1922 represented more than the death of a pioneer. It also marked the loss of an important citizen to all of Miami. Book: “Miami, USA” by Helen Muir. Book: “William and Mary Brickell:: Founders of Miami and Fort Lauderdale” by Beth Brickell. Cover: Portrait of Mary Brickell. Figure 1: Portrait of Mary Brickell. Figure 2: Article in Miami Herald on January 14, 1922.